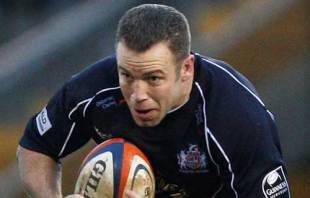 Former Ireland centre Kevin Maggs has left Guinness Premiership side Bristol by mutual consent. Maggs, 34, had been in the middle of his second spell with struggling Bristol before Tuesday's announcement. In a career that has also taken in spells with Bath and Ulster, Maggs racked up 70 caps for Ireland after making his debut against New Zealand in 1997. He began his career with the Bristol youth system and graduated into the first team before leaving for Bath at the end of the 1997-98 season. Following six years with Bath he joined Ulster in the Magners League before returning to Bristol in 2007. "Kevin is a Bristolian through and through," said Bristol chief executive Steve Gorvett. "He started out at the club as a youngster and went on to have a marvellous international career. We wish Kevin and his family all the very best for the future."